The Paleo diet is a focus on eating natural, real food with little or no processing. Man was a hunter-gatherer who ate wild animals, nuts, seeds and berries. This way of eating can lower your risk for disease, promote weight loss and optimise your health. Excessive consumption of high-glycemic carbohydrates is the primary culprit in nutritionally caused health problems. High glycemic carbohydrates are those that raise blood sugar too rapidly. They include all grains including but not limited to rice, bread, oats, rye and corn, candy, potato, sweets, sodas, and all other processed carbohydrates. Processing can include bleaching, baking, grinding, and refining. Processing of carbohydrates greatly increases their glycemic index, a measure of their propensity to elevate blood sugar. But I love oats…rice…and bread! Give me one good reason to eat grains and I will. Go on, I challenge you. How will I get my fiber? You will find that you can get adequate fiber in vegetables and meat alone. Even better, your body will be able to absorb all the yummy nutrients in your meal if you can stand to “pass” the side of rice or pasta. Grains contain anti-nutrients (say it again..ANTI-nutrients. Doesn’t sound so appetizing now does it?) which interact with our bodies function, producing adverse toxic effects inhibiting nutrient absorption and attacking enzymes needed for digestion. Grains also contain lectin and gluten; both linked to inflammatory problems and digestive diseases such as leaky gut. What about all of your vitamins & minerals? We do need vitamins and minerals, like B1 and B2, magnesium and iron, zinc and potassium. But do I need to obtain them by eating a carb-heavy, bulky grain? No, no I don’t. You show me a serving of “healthy whole grains” that can compete – nutrient, vitamin, and mineral-wise – with a big beef salad? What’s that? Can’t do it? Thought so. Protein should be lean and varied and account for about 30% of your total caloric load. Carbohydrates should be predominantly low-glycemic and account for about 40% of your total caloric load. Fat should be predominantly monounsaturated and account for about 30% of your total caloric load. Calories should be set at between 1.5 and 2.2 grams of protein per kilogram of lean body mass depending on your activity level. Eg If you weigh 80kg and train hard, heavy and frequently, you will need up to 180 grams of protein daily. 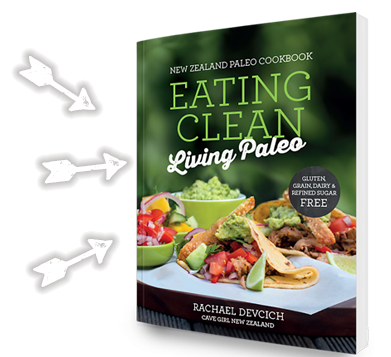 Buy the New Zealand Paleo Cookbook! This New Zealand Paleo cookbook is full of great family-friendly Paleo recipes to help you cut out, or reduce, refined sugars, processed foods, gluten and dairy. With over 100 tasty main meals, sides and salads, breakfast and lunchbox ideas, snacks and delicious desserts, you will find plenty of inspiration to eat clean.